If you don’t mind the size, the Nomu S30 will fit the bill as a rugged smartphone. With the highest battery capacity we’ve seen on a smartphone to date, along with massive system memory and storage capacity, it is one heck of a phone. We’ve seen our fair share of ruggedized smartphones at TechRadar Pro. However, none of them come even close to a top-of-the-range model in terms of features (although some, like the DeWalt MD501, did have the premium price tag). But the Nomu S30 is different, and the first of what promises to be a new generation of rugged mobile handsets that aspire to be high-end efforts akin to the Samsung Galaxy S7 Active. Available in silver or black, the S30 costs around £215 (about $265, AU$365) – sometimes a little less during flash sales – direct from Gearbest, the online Chinese retailer that provided us with the review sample. The phone comes with the usual set of accessories: a pair of earphones, a cable, some documentation, along with a fast charger. The latter can deliver a whopping 1.67A at 5V, 7V and 9V and 1.25A at 12V. Nomu missed a trick here by not having another free USB port on the charger given its high nominal capacity. Out of the box, the device struck us as being different from the usual run-of-the-mill rugged smartphone. It is far bigger (13.4 x 83 x 162mm, weighing 260g) and the manufacturer opted for a more stylistic design – check out the textured back – with polycarbonate plastic being the dominant material used in its chassis (which Nomu says also contains a titanium alloy structure). The four corners are made of rubber, and the sides are metal, but that’s about it other than the aforementioned material. Opting for this design philosophy has allowed Nomu to produce something different for once, with a far more premium feel. Its octagonal shape is similar to most of the ruggedized devices on the market. This handset’s main selling point is the fact that it is IP68 rated which means that it should survive being immersed in 1.5m of water for up to 30 minutes. Nomu actually claims that you should be able to leave it underwater for two hours to depths of up to 5m. The phone feels solid and hefty – the audio connector is located at the top of the S30 and the microUSB port at the other end, with both being covered by flaps. We’d prefer to have both sitting at the same end of the device. The speaker is located next to the USB port. One side of the phone hosts an SOS key (which can be programmed for other purposes) while the other is home to the power button and a volume rocker switch. There’s no dedicated camera button here and, like a lot of the competition, no status lights. A removable section of backplate (located just underneath the rear 13-megapixel camera) hides the microSIM card and microSD card slots. It is easily removable which is a tad worrying, and while preliminary tests showed that water didn’t enter that compartment, we’d certainly prefer another way to secure this flap. Like the Blackview BV6000, the S30 uses a trio of capacitive buttons. The screen, a 5.5-inch Full HD model, is made by Sharp and uses Corning’s Gorilla Glass 4 for extra protection. Inside the S30 is the Mediatek Helio P10, an octa-core system-on-a-chip clocked at 2GHz and sporting the ARM Mali-T860 MP2 GPU. On top of that, it packs 4GB of RAM and a whopping 64GB on-board storage (which can be augmented to 96GB via a 32GB microSD card). The wireless connectivity is a bit of a let-down. Sure, there’s NFC, and it supports Band 20 for O2/GiffGaff/Tesco Mobile and Sky Mobile users, but there’s no 802.11ac Wi-Fi and Bluetooth is limited to v4. We liked the fact that it still has an FM radio and a 5-megapixel front-facing camera (which can be interpolated to 8-megapixel). On top of that the speaker is a genuinely waterproof one and Nomu bundled an LG-made 5,000mAh battery, the biggest we’ve ever seen on a ruggedized smartphone. You should easily be able to get two solid days out of it (and up to 580 hours standby) and thanks to the rapid charger, it’s quick to juice up. The S30 runs on stock Android 6.0 and, unlike a lot of its competitors, has most of Google’s web services loaded by default (there’s no YouTube, though). 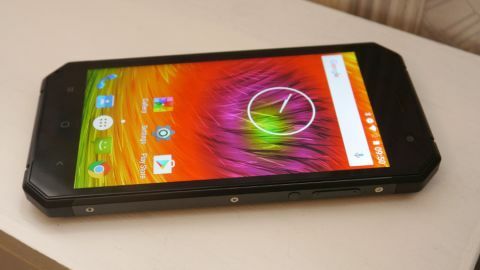 Nomu’s top-of-the-range handset performed admirably during the short time we tested it. The screen produces punchy colours and we didn’t notice any lagging during transitions or when opening tons of tabs on Chrome. We do have mixed feelings about the S30. On paper, it is one of the best value rugged smartphones on the market, and only the likes of the Galaxy S7 Active or the S6 Active prevent it from being the overall ruggedized champion. However, there’s more to a rugged smartphone than merely an IP68 rating or a utilitarian design. Small things like the lack of notification lights, the way the backplate is secured, or the 32GB microSD card support lead us to believe that, while being close to the perfect ruggedized handset, Nomu still has some work to do to grasp that accolade. Then there’s the issue of size. Quite a few competing handset vendors stopped at a 4.7-inch display to keep the overall girth of the device within reasonable limits – but Nomu didn’t. If you have big hands or are used to the likes of the Samsung Galaxy Note series, then this shouldn’t be an issue. For many users though, the size of this phone may be a bit too much to handle.